The Flipkart Republic day sale is live now and we have listed down the best deals the platform has on smartwatches that are from brands like Huami, Mi and more. 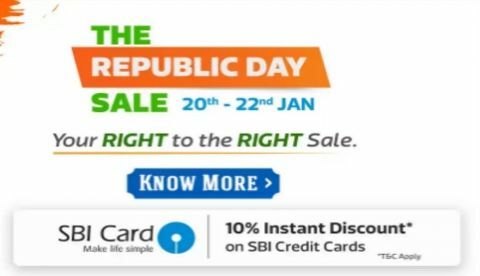 The Flipkart Republic Day sale has started on January 20 and will go till January 23. The e-commerce platform has collaborated with SBI bank and offering an instant 10% discount to buyers who will make payment through the bank’s card. The sale has some pretty good offers on smart wearables that we have jotted down in this lister. So, let's begin. The Mi smart band 3 is now available on Flipkart for Rs 1,999. The smart band offers a battery life of up to 20 days and features an activity tracker that allows you to keep an eye on your workout. Check out the product here. The Fitbit Charge 2, which was launched at a price tag of Rs 14,999 can now be bought at Rs 7,499. One can also get an extra 10% cashback on their purchase via SBI card. Check out the product here. The Apple Watch Series 3 is a waterproof smartwatch that comes with a built-in GPS. during this sale, the watch is available at a discounted price of Rs 39,900. Check out the deal here. The Huami Amazfit Bip is now available on Flipkart at a discounted price of Rs 4,999 down from its MRP of Rs 5,799. Interested buyers can also get an additional 10% discount on their purchase if they will make payment through an SBI card. Check out the deal here.